It is difficult to imagine Viv Richards being any bowler’s bunny, but after tormenting the great man on his first Test tour back in 1974/75 that is what he wrote about the Indian leg spinner. And he never did quite get the hang of facing him. As late as 1979, by which time Chandra’s career was all but over and he was no longer the bowler of just a few years before, he did him again. It was a low-key match at Taunton between Somerset and that summer’s Indian tourists who, Chandra included, had almost all had a wretched time. Richards came in at the fall of the fourth wicket and moved serenely past 30 before Chandra was finally given the ball, and a few deliveries later the day’s entertainment was over, Chandra having once more got his man. Bhagwat Chandrasekhar comes from Mysore in Karnataka, and became a great bowler despite a significant disability. The impression is often given that in fact he became the bowler he was because of that disability, although that is a flawed interpretation of what happened. Chandra was five when he developed polio. It wasn’t the most severe form of the disease, but left him with an atrophied right arm. He lacked strength in it, struggling to even hold a cup of tea comfortably. When he started playing cricket he was a wicketkeeper, and even the weight of the glove tired his right arm. Eventually he decided to give bowling a try. He was able to make a passable stab at bowling orthodox slow left arm, but he tried with his dominant arm as well. He couldn’t bowl off breaks, as he didn’t have the strength in his arm to hold it in place for that extra split second necessary to give the ball a tweak, but he discovered that if it was just a case of rolling his arm over, and letting the ball come out of the back of the hand, that he was fine. There was no magic in wrist, fingers or shoulder, he didn’t have any extra strength for that, but his arm did whip through, and as well as getting just enough turn to beat the bat, he found he could extract bounce from just about any surface, and that he could vary his pace as well, from the merely waspish to the distinctly sharp. As Chandra grew up his parents tried to make him concentrate on his education. They were perhaps just being protective of their partially disabled son, and struggled with the idea that he might ever become a top class player, but once he did start playing regularly, and built up strength in his right arm, he quickly rose through the ranks, although there was a bit of luck along the way. His unusual action meant he caught the eye, and in one junior match he was spotted by Test batsman ML Jaisimha, who recommended him to the Mysore selectors. They were impressed, and soon picked Chandra, who repaid Jaisimha by dismissing him twice in only his second First Class match. After 25 wickets in four Ranji Trophy matches Chandra found himself in the South Zone side against the North. With 5-78 in the North’s first innings Chandra was the pick of the South’s bowling. The North’s skipper, the Nawab of Pataudi, clearly liked what he saw. As a result less than ten weeks after his First Class debut Chandra was playing in his first Test, India’s second against Mike Smith’s 1963/64 England side. The hosts batted first, and Chandra got a first ball duck, castled by the giant Dave Larter, whose career was sadly wrecked by injury. But Chandra held an early catch in England’s reply, which settled his nerves, and although he didn’t find success with the ball straight away, his 4-67 represented the best return by India’s bowling and despite not improving on those figures he kept his place for the rest of the series. It was not an exciting contest, all five Tests being left drawn. Chandra took 10 wickets altogether, at 33.90. One man, Salim Durani, took more, but his 11 were at greater cost, and he played in all five Tests, whereas Chandra missed the first. The discovery of the season underlined his promise in the penultimate match of the Indian season, when he appeared for Rest of India against the Ranji Trophy winners Bombay. The latter were a powerful outfit, chock full of Test players and champions for the last six years. They comfortably beat the Rest, who could score no more than 83 and 157, but it was as well that their bowlers were at the top of their game, as with 3-56 and 7-41 Chandra gave the champions’ batsmen all sorts of problems as he finished his first season with the wonderful return of 63 wickets at 17.95. India’s next visitors were Australia, who played three Tests on their way home from England. These matches were therefore right at the beginning of the season, but in the contrary way that selectors sometimes behave Chandra was left out of the Indian side for the first Test. Had he played, and been able to provide the attacking foil to the 11 wicket Bapu Nadkarni then India might have won. As it was Australia scored too many runs and won comfortably. The error became apparent in the second Test when Chandra, restored to the side, took four in each innings to help India square the series. Peter Burge took some liberties with all the Indian bowlers in his first innings before, in the second knock, falling to Chandra for a third ball duck. Chandra always maintained it was his best ever delivery, a leg break that took the edge of Burge’s bat before knocking back the off stump. Burge was not a man given to extravagant gestures, but before walking back to the pavilion he did stay at the crease momentarily to applaud the bowler. There was no Test cricket for India in 1965/66, but Chandra’s star was still very much in the ascendancy as he enjoyed what was to remain his best ever season, and he was expected to be a matchwinner the following year as West Indies, who had never before been beaten by India, arrived for a five match series. The visitors batting was powerful to say the least, containing Conrad Hunte, Rohan Kanhai, Basil Butcher, Seymour Nurse and Garry Sobers at the height of their powers, as well as a young Clive Lloyd. But there was a feeling their bowling was not so strong and that India had a chance. Sadly for the home side however their batting let them down, and they lost the first Test by six wickets. It might have been different had Chandra had some support. He took 7-157 in a long bowling stint in the first innings, and all four that fell in the second. In the second Test Bishan Bedi made an impressive debut, but the all important toss having been won by Sobers it was he and Lance Gibbs, rather than Bedi and Chandra, who took advantage of the wicket deteriorating. The third Test of the West Indies series was important, if not for the result then for the significance of the first appearance of The Holy Trinity, Erapalli Prasanna, five years after he had last played for his country, coming back. And India should have won. They had seven West Indies wickets down in the fourth innings with 90 minutes to go, but in the face of some excellent spin bowling Sobers and Charlie Griffith clung on. There was some negative play by the batsmen, Griffith in particular, but having given Sobers a couple of early lives India had only themselves to blame. At one point Chandra’s frustration was such that he bowled a bouncer at Griffith. The delivery hit home too. It was the last innings of the series and, one suspects, Chandra wouldn’t have done the same thing had the circumstances suggested that their roles might ever be reversed. A few months later the Holy Trinity came to England. There was a wet and miserable first half to the English summer and Chandra with the ball and skipper Pataudi with the bat were the only Indians to emerge with much credit from a 3-0 defeat. After a trip to East Africa Chandra and the rest of the Indian side arrived in Australia in November. For the first time a jaded Chandra experienced failure. He took just one wicket in the first two Tests before returning home with a leg injury. The leg healed uneventfully, but then Chandra suffered a horrific injury in a road traffic accident. He was riding a motor scooter, making his way to his work in a bank, when he was struck by a wheel that had worked its way loose from a trailer. He smashed his jaw on the road as he was knocked down, and his left wrist was fractured as well. His broken jaw had to be wired, and he was on a liquid diet for some time. Such were the effects he missed the whole of the 1968/69 season, and wondered at times whether he would ever play again. Chandra was back, and in form in 1969/70, but the selectors seemed to have forgotten him. When India finally did take a Test from West Indies, and they took the series as well, in the Caribbean in 1970/71, Chandra wasn’t even in the party. His Test career might have been finished, had it not been for the perceived weakness of English batsmen against leg spin, so he was named in the party that came to England in 1971 this time for, crucially, the second half of the summer when English wickets were much harder than in May and June. India made history in 1971 by, as they had a few months earlier in the Caribbean, winning their first Test in England and the series. They were perhaps fortunate to go into the final Test at 0-0, and having bowled badly at Old Trafford Chandra might not have played at all. But he put in a fine performance in a county match in the lead up to the Oval Test and stayed in the team. When the game got underway England secured a first innings lead of 71, and then got to 23-0 in their second innings. Fortune favoured Chandra again at that point, as the Indians were unarguably lucky when John Jameson was run out, backing up as Chandra managed to deflect a Brian Luckhurst drive onto the stumps. But there was no luck needed from then on as Chandra took 6-38 in an innings that disintegrated to 101 all out, and India went on to claim a historic victory as they chased down the 173 needed with four wickets in hand. Chandra’s greatest triumphs came in the return series against England in 1972/73. England unexpectedly won the first Test, but Chandra was still the star of the show taking a Test best 8-79 in their first innings. Wisden said his bowling looked little short of magic. He had nine more vitims in the second Test and seven in the third as his country roared back into a lead they didn’t relinquish. Chandra continued to take wickets even in the last two Tests, during which the Indians were taking no risks, and he ended up with 35 for the series, at a cost of just over 18 runs each. In 1974 England had their revenge, a thumping 3-0 victory putting the Indians to the sword. Chandra was injured in the second Test, but before that had taken just two expensive wickets. After getting home he recovered enough of his form to establish his pyschological mastery over Viv Richards in 1974/75, and he maintained it in the Caribbean a year later. But after that there were just two more seasons in which Chandra was to bowl well. 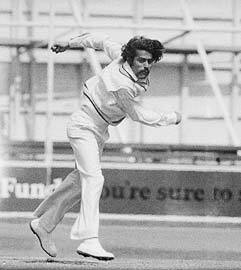 He took his fair share of wickets against England and New Zealand at home in 1976/77, and had he had the redoubtable Eknath Solkar around the bat he might have done even better, but he was no longer the matchwinner that he had once been. A year later he had 25 victims in Australia, but that wasn’t a full strength Australia – the first eleven were away playing for Kerry Packer – and it would have been a major surprise if Bob Simpson’s young charges had been able to handle Chandra with much confidence. Eight months after the Australian tour ended, and 18 years since the two countries had last played Test cricket, India toured Pakistan. The hosts had all their Packer players back, and had a formidable batting line-up. India lost the three Test series 2-0, Chandra’s 8 wickets costing more than 48 runs each, although in fairness to him it should be pointed out that he was still India’s most effective bowler, whether measured by wickets taken or average. Next up for Chandra and India were the West Indies. There were six Tests and India took the series on the strength of the only game that produced a definite result. Chandra took 12 wickets at 35 in the four Tests for which he was selected, but he was clearly not the player that he had been. West Indies were shorn of their Packer players, and whilst the Caribbean’s depth in the pace bowling department meant that that aspect of their game suffered little, the batting was weak, and on his home wickets Chandra really should have done much better. If there was any consolation it was that the man who replaced him for two Tests took just a single wicket at a cost of 107 runs. Despite a poor home season Chandra came back to England in 1979, but the finale of the career of the hero of the Oval 71 was anything but a fitting end to his Test career. His final match was the first Test, a heavy defeat where he went wicketless and was hampered by an achilles tendon injury. He was not selected for the Test side again, and his retirement was announced at the end of the 1979/80 domestic season. His bowling on his home pitches had been perfectly reasonable, and he was not yet 35, suggesting he could have played on, but he said he wanted to give younger players an opportunity, and doubtless his appetite for the game was not what it had once been. Great piece, Martin – my fave of the trinity. Very good article Fred. Very much looking forward to the piece on the third member of the trilogy. To recover from a broken jaw and wrist only to be dropped by the selectors, but then finally win a Test match for India with figures of 6/38 is just awesome stuff!